Safety of Juniper - mythbusting! The dried 'berries' (actually they are soft little 'cones' like those from Pine trees) of Juniper, a tree that if given room can mature to a magnificent 10 meters. Juniper has been highly regarded as a purifying medicine by many cultures and its observable effects can be very powerful. The Greeks used Juniper as a purifying herb and the original Olympians believed the berries increased physical stamina in their athletes. The ancient Egyptians used Juniper extensively as a medicine and also to embalm their dead. 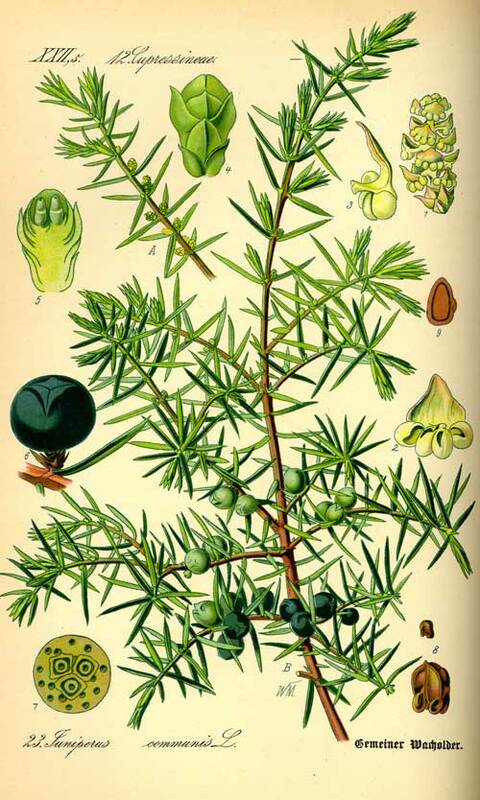 As recently as world war II, French nurses burned Juniper in hospital rooms to fumigate them. During the middle ages Europeans believed that planting a Juniper beside the door kept witches out and they could only enter if they correctly guessed the number of its needles, an impossible challenge! 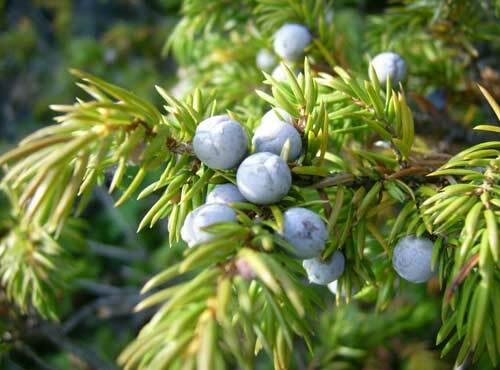 By the 17th century Juniper was a popular diuretic (increasing urine flow). Culpeper wrote 'Juniper provokes urine exceedingly; it is so powerful remedy against the dropsy that it cures the disease'. The Chinese, American Indians, and old European cultures of medicine all highly regarded Juniper as a blood purifying kidney tonic. One of the great European herbalists of the 20th century, R.F. 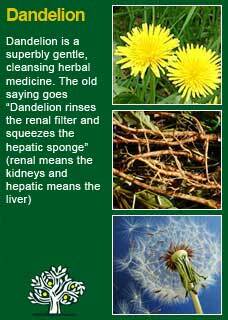 Weiss, prescribed Dandelion in the spring and Juniper in the autumn for chronic arthritis, gout, neuralgia, and rheumatism. 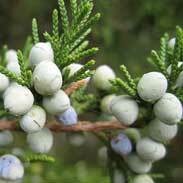 Thomas Bartram writes that Juniper's actions are 'urinary antiseptic, stimulating diuretic, digestive tonic, emmenagogue, carminative, sudorific (can increase sweating), the action of Gin as a diuretic is due to oil expressed from the berries. 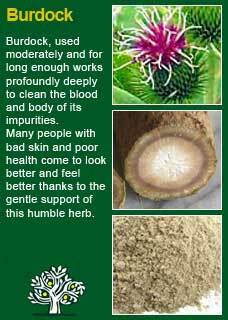 Bartram suggests it may be used for cystitis, renal suppression (scanty micturition - urination) catarrh of the bladder, proteinuria (albuminuria) digestive weakness caused by poor secretion of gastric juices, aching muscles due to excess lactic acid & amenorrhoea. Bartram suggests a dose of half to one tsp of the crushed berries, steeped for 30 minutes in a covered cup of freshly boiled water and to drink half to one cup of the strained infusion. 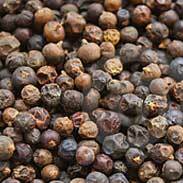 The British Herbal Pharmacopoeia (BHP) describes Juniper's actions as diuretic, antiseptic, carminative, stomachic, antirheumatic and says it is indicated for acute or chronic cystitis, flatulent colic & 'rheumatism'. The BHP suggests a dose of dried ripe fruits 1:20 in boiling water, dose 100mls and recommends a tincture in the ratio of 1:5 in 45% ethanol with a dose of 1-2 mls up to 3 times a day. Just about every book or article on Juniper berry carries the caution “do not use Juniper where there is any chance of kidney disease”. Once a caution like that gets into the books then usually nobody thinks to question it and every subsequent author quotes the previous ones. Fortunately, in the case of Juniper, this caution actually has been questioned. It was traced back to the first time it appeared in print to a man called Potter in 1898. Potter in turn got his information from experiments done at the time with animals using high doses of the isolated essential oil from Juniper. However, a recent toxicological study on rats also using high doses of juniper oil found no damage to their kidneys. The authors determined that the reputation for juniper oil as a renal irritant came from the use of oils containing high levels of pinenes which are known irritants to the urinary tract. Higher levels of these pinenes would result from co-distillation of the needles and the branches and the unripe berries with the ripe berries, a practice that no longer occurs today where only the ripe berries are used. 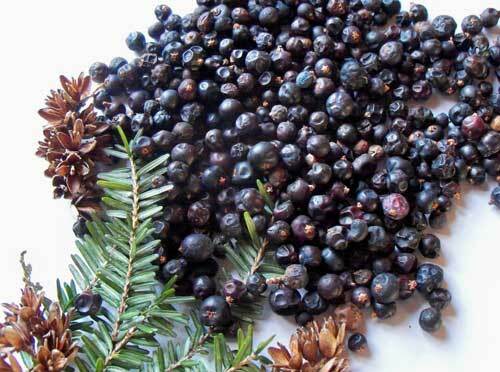 It can be concluded that ripe juniper berries and juniper oil distilled only from the ripe berries can be used entirely safely however, we must maintain a healthy respect for the potency of these tiny berries to activate an increased kidney function and to recognise that this is not something that one should do overlong or over-strong. Nor would I suggest it to be a herb to use for young children or during pregnancy. 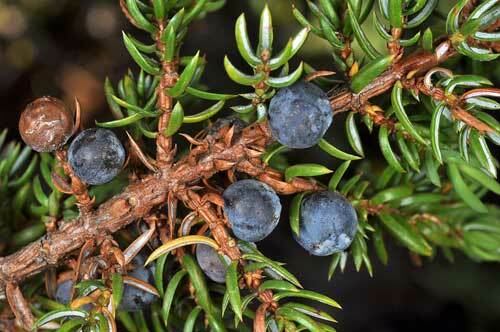 A herb that has the power to invigorate, activate and tonify the kidneys is simply of enormous value and I personally believe that Juniper berry is one of the strongest and best of all of our natural medicines to cleanse and strengthen the kidneys. Given how vital it is to have healthy kidneys this means that Juniper takes on an exceptionally important role in the initial treatment programs of many of my patients. Most people know to associate their liver health with the cleanliness of their blood, but less people realise that in their own way the kidneys are just as crucial to keeping everything clean. The people I give Juniper to the most have become too 'damp' or congested. They may have a coating on their tongue that suggests their system needs a cleanse or they have symptoms of toxicity such as retention of water, a dull, heavy ache in their bodies or less than healthy skin. I confirm that these findings are indicating a need for cleansing when I do a blood test with my patients that we look at together through a microscope-to-screen relay at well over 1000x magnification. Juniper will almost certainly be on the menu when I see blood with a characteristically murky, congested appearance with too many particles of 'debris' in the plasma. 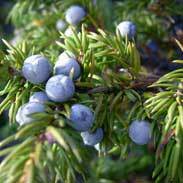 As always dosage is a critical factor to get right with Juniper as it is with all herbs. It's a stimulating herb, too much will not help the body as much as stress it, too little will fail to achieve its potential. In tincture form I will typically use around 2-4 mls in a day in divided doses. Particularly with students of herbal medicine in mind, I have further detailed notes about Juniper in the constitutional section below. In any case, I recommend anyone who is studying herbal medicine or who wants to understand this plant ally at a much deeper level for their own reasons to follow the old practice of experiential learning by taking a small dose of Juniper tincture or to work over a few of the berries as described in the link above and then, with a quiet and attentive mind, observe for themselves what happens and how it makes them feel. All the history, science and other writings aside, this is probably the best way to truly appreciate the power of this simple plant. I am sure that your body will soon tell you how it experiences the Juniper and the effects will be quite noticeable, as mentioned earlier, every machine works better when it is clean! 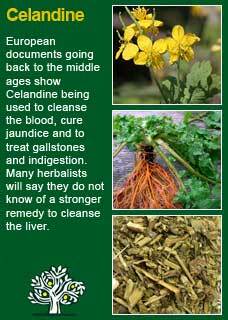 Juniper combines perfectly with Celandine, for a particularly powerful whole-body cleanse, with Dandelion for a more gentle blood purification, with Burdock root to help deep set conditions that are affected by toxicity and with Cleavers when there is a great need to cool the body from congestion and inflammation. Much of the information here about the traditional uses of Juniper is consistent with the model of thinking whereby one may treat problem A with plant B. There is value in this approach, especially in how it helps us pass on useful knowledge to one another, but it falls short in one vital area; and that is that people are not all cut from the same cloth! Something that works brilliantly for one person may do less for another -- why is this? Juniper has frequently been seen to be of particular benefit to those of the EB (Elephant-Butterfly) constitution. By virtue of their innate sensitivity, these are people who often lead the 'purest' lifestyles and yet there are often the clearest signs that they need help with cleansing in the beginning stages of a healing journey to help some long-standing problem or another. Juniper can be the exact right remedy to use when the EB has sore joints and/or a heavy white coating on their tongue, something that is quite a common finding in an EB who needs such cleansing and can mistakenly lead a person to think they were a damp constitution as a consequence. Ideally you will be able to lightly bruise the berries before pouring over the hot water. This could be done in any method that is close to hand, obviously a few quick thumps in a classic mortar and pestle would be ideal but you will still be able to break the surface of the berries with the back of a spoon or the end of a rolling-pin while they were sitting in whatever cup or container you were using for the infusion before you poured in the freshly boiled water. Whilst they may need its help less often, when it is appropriate to use Juniper for an Eagle constitution it is quickly effective, and they are usually very responsive to it. There may be quite different indicators to think of using it in these instances; perhaps they have accumulated a toxic overload from drugs or injurious substances in their diet, perhaps their heart is aging and their kidneys need some quick support whilst remedies such as Hawthorn or Reishi have time to work, perhaps there are physical signs, such as heaviness or soreness in the low back or legs, or a discoloured tongue, or a skin condition that has seemingly come out of nowhere in later life. Again, the tea, tincture or the berries themselves are all suitable but a short course at a higher than average dose is much more likely to be of the most help to an Eagle than a longer treatment at a lower dose. Tiger constitutions seem to thrive on a strong course of Juniper for a finite period of time (I mostly use it for about a month for the typical Tiger) and they seem to do particularly well on the tincture where I will happily use up to 4 mls in a day, i.e. a significant amount. 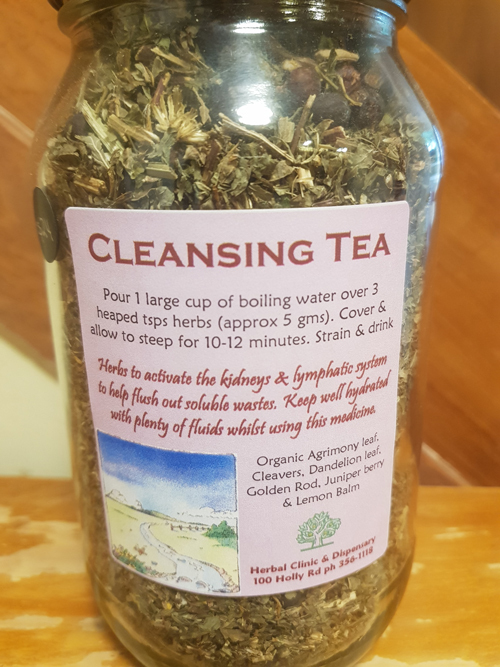 Taken as part of a general cleansing program it reliably works to activate the kidneys to increase their filtration of soluble toxins out of the blood. I am certain it has been a large part of the reason why so many Tigers, after doing the cleansing program in which Juniper has played a key role, feel uncaged and ready to take on the world! Juniper berry has some specific affinities with the Bear constitution. If you who are reading this are a Bear, and you wish to know Juniper much better, I recommend you take it as a single, i.e. by itself, perhaps just a few of its berries to start as described above, or just a few drops of its tincture that you slowly increase as your body gets to know it. Juniper is likely to have potent effects on the system of a Bear, increasing kidney function certainly, but also stirring up some of the deep waters that usually come to rest in the low back and low belly of the Bear. 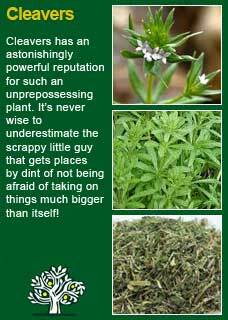 It is a herb that has the potential to affect significant change. Of course, it may be taken or given when there are any signs of kidney weakness or damp encumbrance but, more so than other constitutions, they will likely want to pulse the treatment, i.e. to use it for a short time, then take a break, then pick it up again, then stop for a while, and so forth. it can have an especially strong effect in this constitution. The power of Juniper to work at a deep, mind-body, emotional level has certainly been seen in Bears but not just them. All people from all constitutions must find ways to deal with their fears if they will have peace and happiness in their lives and it should be understood, as it has been from the East for millennia, that the kidneys, and the way they work, are strongly related to how we manage and process our fears. When people, from any constitution, have deep-felt anxieties and worries, those feelings will mostly be noticed in the form of associated thoughts in the mind but the physical reality of the existence of the fear invariably goes down into the deep 'waters' of the body. They may or may not manifest in physical signs or symptoms, but they are there nonetheless. The kidneys are also understood to be the part of the body that holds the drive, the will, the determination of a person. If our fears overcome our will then we may freeze or lose our strength. There is much to be said for any person who would understand themselves more deeply, and who would prefer to face their fears and not be ruled by them, to use a remedy such as Juniper with the intention to help release those deep, subconscious fears and worries.